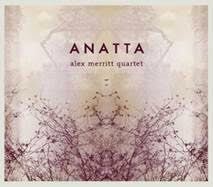 bebop spoken here: CD Review: Alex Merritt Quartet - Anatta. Takes on Monk's Ugly Beauty and Pannonica and, straight out of left field, Eubie Blake's Memories of You! And why not? It's one of the great jazz standards and, without wishing to denigrate Alex's own compositions, will be around long after Justin Time-berlake, and the inspiration for the title, have been buried in the sand! But, for today, this is as beautiful a British offering as you're likely to hear all year. Merritt's tenor has the aforementioned Getz/Marsh sound that I love - dry but not arid. Turville - you want a piano man who can cover all the bases? Look no further. Jarrett? - nah! Lasserman impressed on his recent Sage Gateshead gig with Arguelles and no doubt he'll be back with this quartet. Whoops! No! 3 gigs in London, 1 in Colchester, 1 in Cambridge and, their most northerly - Wellingborough, Northampton. Jeff Williams' CV just about matches anyone's and his sympathetic, intuitive playing here tells us why. Memories of You is beautiful and, take it from me, neither Eubie or Benny [Goodman] are turning in their graves! Amazingly, this is due for release on the F-ire label - a label that doesn't always stay within the walls.They've done it here! Bravo! The CD, Alex Merritt Quartet - Anatta will be released on December 4 (F-ire) with an official launch at the Vortex Jazz club on December 10.